Ever since we started tackling marine cryptids (not to be confused with real cryptic species) during our annual Week of Ocean Pseudoscience, people occasionally e-mail me with new “rotting rodent” style monsters. This news story – Behold: The San Diego Demonoid – has been making the twitter and e-mails rounds today. 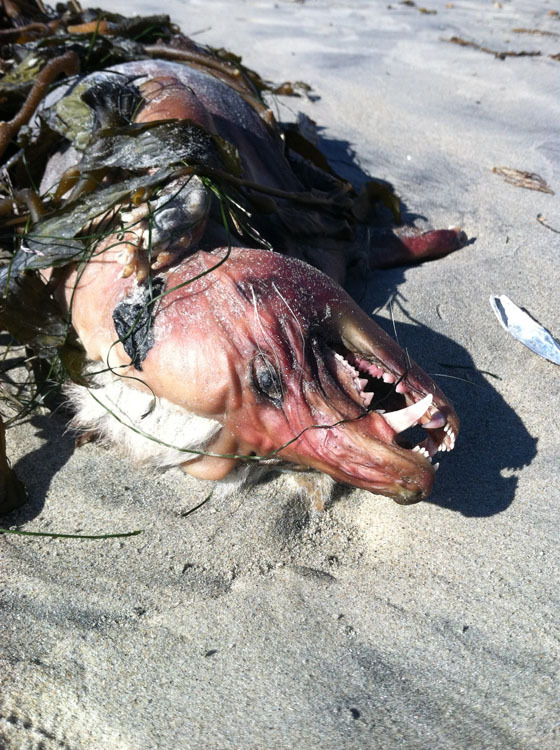 Like the Montauk Monster a few years back, a waterlogged, decomposed critter washed up on a beach, this time in San Diego, and people unfamiliar with what decomposing varmints look like branded it some sort of cryptid. To the right is the uncredited photo (now credited to Josh Menard) that’s been cropping up in various corners of the internet. Like many “cryptic critter” photos leaked to the press, the ones associated with this story fail to show the entire animal or provide any sense of scale. That should be red flag #1 that it is, in fact, a common local resident that is being dressed up to appear more monstrous than it really is. 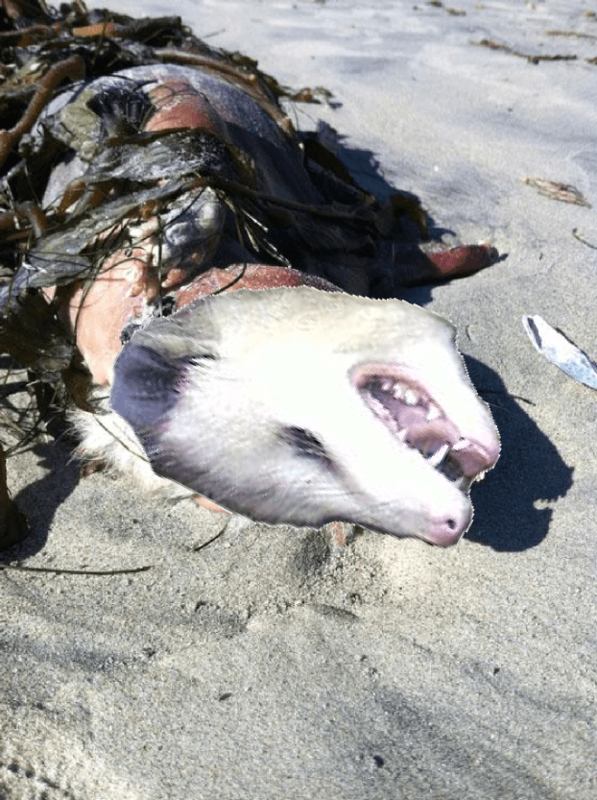 Sorry folks, this one is just an old, waterlogged, partially decomposed possum. Ocean of Pseudoscience Shorty – Bloop! This is what a Marine Invertebrate Zoology class looks like. JOSHUA MENARD FOUND THIS HE IS ONE OF MY VERY GOOD FREINDS AND THIS AUTHOR IS JUST A SKEPTIC!!!! HE WAS NOT THERE. You say skeptic like it’s a bad thing. I’m pretty sure the same critter is the source of the “giant sewer rats” legend in New York City. those teeth of your “possom” aren’t even NEAR the same size Goob! Actually, if you look at the skull, they’re exactly the same proportions. And what is a “possom”? Is that anything like a possum? is that anything like an opossum? Sure kelp structures can vary, but take a look at a typical San Diego beach, and you know that your “monster” could be dealt with fairly easily! Yeah, I’ve seen hundreds, maybe thousands, of possums in my life, and that is very clearly a possum, sir. Honestly, I don’t see how anyone could think it was anything else unless they’d never seen one before, really. You’ve seen thousands of possums? Where do you live, friend? I’ve only seen a few. Didn’t you live in SC for, like, 3 years? And NC for 5 years before that? How have you not seen hundreds of possums?